ARMAN TATEOS MANOOKIAN | Geringer Art, Ltd.
ARMAN TATEOS MANOOKIAN (Armenian American b. 1904 d. 1931). Born in Constantinople in 1904, Tateos Manookian grew up fascinated with the military ships he often sketched from age 7 on. He studied at the school of St. Gregory the Illustrator in Constantinople until his life was disrupted by the terror unleased by Turks on Armenians in 1915. He left in 1919 to study art in the United States, and attended the Rhode Island School of Design on a state scholarship. He joined the U. S. Marines in 1923 and became a clerk to Major Edwin McClellan who assigned him to illustrate a book of Marine history. Manookian also contributed illustrations to “Leatherneck” the magazine of the U. S. Marines. 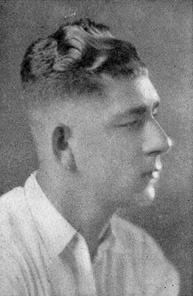 Upon leaving the Marines in 1927 he created illustrations for “Paradise of the Pacific” magazine and also created murals in the Honolulu area. His was becoming recognized as an outstanding Modernist when he took his own life, by poison, in a fit of despondency. As a result of his early death, his original illustrations and paintings are rare and sought after.